"It's their last chance to see that there's another world out here." I'm listening to Kim Markhausen as we stand on the shore of Red Lake, near the western border of Ontario, Canada. Kim and his wife Susan own Black Bear Lodge, a fishing outpost that caters each summer to hundreds of high school students and their teachers. Together, for the past twenty years, Kim and Susan have shown this land to countless young people. I'm here because Black Bear Lodge is also an entry point for canoeists to the northern trails of Woodland Caribou Park, to the eastern Bloodvein River. There IS another world out here. Over the last two weeks I've found a world of fire scarred shores, of primitive muskeg trails, of majestic islands, roaring waterfalls and quiet winding channels. It's home to beaver, black bear, moose and woodland caribou. It's a world where old pictographs send cryptic messages from the people that once lived here, long ago. It's a world that differs from Ontario's Quetico Park, or the Superior National Forest of Minnesota, a world of adventure, challenge and abundance. There are eight hundred and forty road miles between Milwaukee, Wisconsin and Red Lake, Ontario. My canoe seems to dwarf my son's old Toyota as I climb behind the wheel at six o'clock on this Friday morning. In years past, I usually knew exactly where I was going, exactly what I would run into. This time, however, I'm not going to Quetico Park, my usual destination, and I really don't know how the trip will turn out. By late afternoon, I pull into International Falls, Minnesota. The town has a no-nonsense look, a lumber yard on the main street seems as right as the shops and motels that cater to visitors. I don't have a good road map of Ontario, so I make a quick trip to a gas station and buy one. Back at the motel, I spread the map out on my bed and take a look. Here is Red Lake, the last town I'll travel through, and I see half of Woodland Caribou park on the top of the map. I flip the map over, looking for the rest of Ontario. I flip it over again - what the? Only half of Ontario is shown on this map! Where's the northern half? It takes a few seconds before I remember that I bought a road map, and there are no roads beyond Red Lake! Early the next morning, I join the waiting line that forms at the Canadian border. The line of cars creeps onto a steel bridge, right into the workings of a Boise-Cascade processing plant. "Where are you going?" asks the official as my turn comes. "I'm going to Woodland Caribou Park." I've read quite a few spy novels and know that this is no time to get talkative. "How long will you stay? What type of guns do you have?" "Two weeks. I don't have any guns." Cameras roll and a strobe light flashes as my picture is recorded. Evidently I look harmless enough and I'm allowed into Canada. Immediately, I'm stripped of two dollars and seventy-five cents as the toll for the bridge I've just crossed. The border crossing ate up about forty-five minutes. Now the scenery improves as I follow the road that snakes inland. The highway rises over Rainy Lake, giving me a taste of rugged open landscape. The clean, clear air is stimulating, making it seem that many things are possible here. Soon I'm on route 502, heading north again. Hours go by as the road cuts through solid rock and the stations on my radio fade to static. Small rock sculptures decorate the highway, tiny arches, shapes of animals, some with pieces of wood or bone. Are these small shrines? I don't know it yet, but in just a few days I'll be depending on small piles of rocks to guide me through a lonely, primitive wilderness path. Dryden appears, then for a brief few kilometers, I'm on the Trans-Canada highway, a route that extends the length of the country. The road heads north again on route 105 as the sun climbs high in the sky. Near Perralt Falls, a small bear cub loiters near the road, completely ignoring the traffic that zooms by. I'm amused by the "moose crossing" signs; the pictures of moose here look malevolent, like an angry bull moose in the middle of the rutting season. I make a brief stop in Ear Falls, at the Four Seasons Sport Shop. Permits are available here for camping in Woodland Caribou Park. I also buy a seasonal conservation fishing license. Before long, I'm in Red Lake, and turn left onto route 618. The Ontario Government Building is closed today, so I continue on 618 for 11 kilometers (6.8 miles) to Flat Lake Road, a gravel road that leads into the forest. I don't want to shake my son's car to pieces, so I slow down to thirty kilometers per hour. 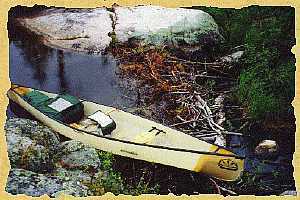 Even so, the canoe, solidly tied to the car for eight hundred miles, starts to work loose and slip off the top. It takes forty-five minutes to drive the seventeen and a half kilometers (eleven miles) of gravel road to Black Bear Lodge. The "parking lot" is really just a widening in the gravel; a slate colored one-lane road leads to the lodge. I learn from some other visitors that all vehicles are left here on the road, and that I should walk to the lodge. Susan Markhausen is in the lodge kitchen, and we talk for a minute or two about the park. I hitch a ride on the lodge tractor and get a free ride back with my pack. Another trip for the canoe, and I'm ready to start my trip.